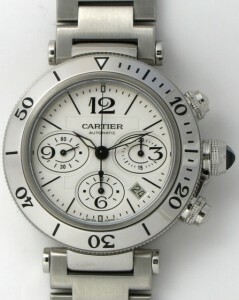 Many Cartier watch lines symbolize important landmarks in the company and timepiece history, and the Pasha is no different; according to various sources, the first water-resistant Cartier watch was named for the Pasha of Marrakesh, who had specifically requested a watch that could be worn in his swimming pool. 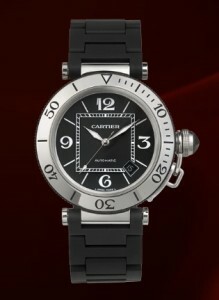 The Pasha Seatimer Steel W31089M7 watch is an elegant, modern watch that abides by the classic style of Cartier and the impetus for its initial design. The design and style of the Pasha has stayed largely consistent over the years, and the Pasha Seatimer Steel W31089M7 still closely resembles the early Pasha watches. The bezel features minute number markers from 10 to 50 and the 3, 6, 9, and 12 hours are labeled on the watch face; the classic, highly serifed font imbues the watch with a sense of legacy and sophistication. The date is displayed between 4 and 5 o’clock, in a slightly unusual but still easily readable location. Cartier’s Pasha Seatimer Watch W31077U2 is similar to the W31089M7 in design and style, but the black rubber covered steel bracelet and black dial heighten the sense of contrast and suggest a more rugged attitude. This model doesn’t have the chronograph functions of the W31089M7, except for the same date placement, and as a result, the face is simpler and more highly contrasting with the white number and tick marks against the black face. The Pasha Seatimer Lady W3140005 is the aesthetic complement to the W31089M7 with its steel and white coloration. Like the W31077U2, it has a rubber enclosed strap, but the white of the lady’s watch and silver opaline dial keep it in the same light tonal area as the W31089M7. 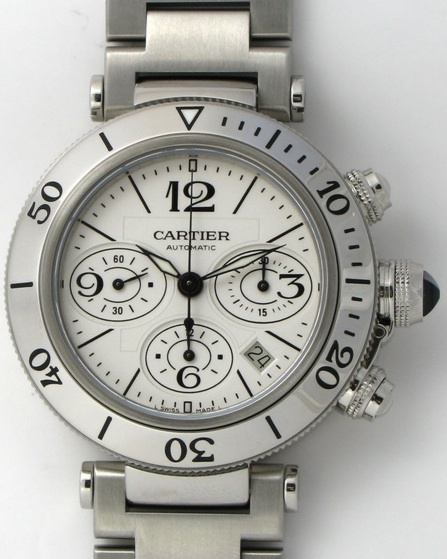 The Cartier Pasha Seatimer W31089M7 watch is a beautiful, durable piece of jewelry and utility with a classic style that has been maintained and refined through the years. This iteration is clean, functional, and recognizable, though the history, style, and brand name come at a high price.